The Oberoi is indeed an ideal retreat if you wish to have a luxurious vacation in Mauritius. Apart from the ultra-modern rooms and en-suite bathrooms, the hotel offers world-class amenities like a fully-equipped gym, spa, lavish dining options, a gorgeous indoor pool and much more. You can also indulge in a variety of watersports at the beach nearby. The Oberoi Mauritius is no less than a paradise on earth. Nestled in a glittering location and embraced by the lush green sub-tropical gardens, this dazzling property is honored amongst the most lavish and luxurious staying options in the Island destination of Mauritius. Oberoi Mauritius is ideal for all kinds of visitors whether it is honeymooners who visit here to celebrate love or travelers who are on their family vacation. Along with this, the Oberoi Hotel Mauritius also greets a frequent business traveler as well. The ambiance and services offered by this hotel are commendable and unrivaled. The hotel features luxury pavilions and villas which are quite different from room and suites offered by other luxury hotels. These pavilion and villas are decked with rustic oak and nature cane furniture, marble bathrooms, walled gardens, charming thatched roofs, and modern technology. This stunning property is comfortable located almost 15 km from the capital city of Port Louis and 6 km away from the Mauritius Aquarium. 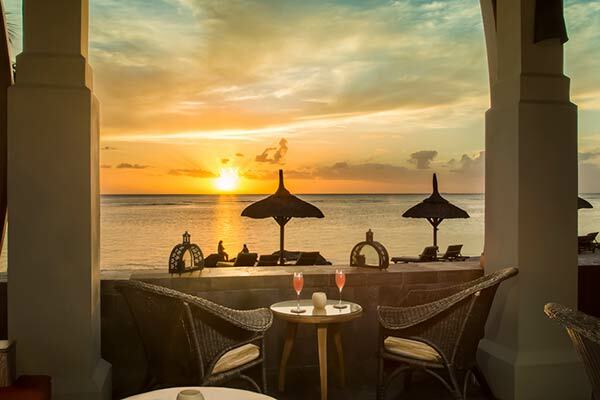 This beachfront hotel Oberoi Mauritius enjoys an unparalleled position on the shores of the Turtle Bay and houses four national monuments that take back to the French Colonial period. Also, the guests can enjoy the scenic beauty of nearby tourist attractions as well. Want best Pointe Aux Piments Packages with this Hotel? Oberoi Mauritius comprises magnificent pavilion and villas. All of them are famed for offering either the stunning views of Indian Ocean or hotels lush, Subtropical Gardens. These are divided into 9 categories namely Luxury Garden, Luxury villa with Garden, Luxury villa with private pool, Premier Villa with private pool, Two bedroom luxury villa with private pool, Presidential Villa with private pool, Royal Villa with private pool, Two Bedroom Presidential Villa with private pool and Two Bedroom Royal Villa with Private Pool. All of them feature wall to wall windows, high-speed internet access, an electronic safe, espresso maker and a plethora of other facilities. Oberoi Mauritius Packages include all sorts of facilities which are more than enough to satiate the luxurious needs of the visitors. Guests can relax and unwind themselves in Oberoi Spa which is secluded by indigenous trees and offers a complete range of spa therapies. With world-class facilities like personal trainers and yoga classes, there is nothing that one wont find here. Enjoy water activities like snorkeling, diving, windsurfing, and fishing. It houses the finest dining restaurant where one can savor super delicious local specialities and lip-smacking international cuisines. With three restaurants and a bar, one is sure to have a good time here. The Main Restaurant serves some delicious Creole, Asian and International favorites. The On The Rock Restaurant is a good place to enjoy some Italian and BBQ dishes while The Gunpowder Room has some savoring Japanese and local varieties. One may also enjoy a cocktail at the bar. Staying in the Oberoi Mauritius will surely offer one an unforgettable experience. This elegant hotel will definitely allow guests to collect memories to cherish for a lifetime. Does Oberoi Mauritius offer Jacuzzi Facility to its guests? Yes, Oberoi Mauritius offers Jacuzzi facility to their guests so that they can taste at its best. Can I enjoy Japanese food at Oberoi Mauritius? Yes sure. Guests can enjoy finest and delicious Japanese cuisines in the rustic former armory at Oberoi Mauritius. Please let me know up to how many devices I can enjoy high-speed internet connection at Oberoi Hotel. Travelers can enjoy high-speed internet connection for up to four devices at Oberoi Mauritius. Their connection is available without any interruption. Can I find an espresso coffee maker in a pavilion and villas? Yes, guests can easily find an espresso coffee maker in all pavilion and villas at the Oberoi Hotel Mauritius. What about Oberoi Mauritius reviews? According to the Oberoi Mauritius Reviews and feedbacks, this hotel is honored as the excellent property in Mauritius stay. It is a recognized brand and thus offers lifetime experience to its patrons. Accommodation in Oberoi in Mauritius is designed to complement nature and luxury at its best. Guests who opt for this lavish hotel can bathe in an uninterrupted comfort and pleasure. Its wonderful settings allow the visitors to enjoy views of either hotels sub-tropical garden or lush emerald lawns of the Turtle Bay. Perfectly said by someone that once classy, always a classy and this line suits well to the hotel Oberoi Mauritius. Featuring private dining area where dinner is served by a personal butler, complimentary high-speed internet access, stunning ocean views, an iPod Dock and advanced technology, this elegant hotel is a perfect gateway to luxury. Oberoi Mauritius is completely unrivaled and thus staying in Oberoi Mauritius will offer guests an outstanding and unsurpassed experience. Choose to accommodate in this lavish hotel and enjoys the perfect combination of romance, comfort, and relaxation.